Anti-Smog Film Is Pulled In China; Protesters Reportedly Detained : The Two-Way A human rights group says police in China detained two people for protesting the government's approach to smog. A popular film about the same topic was recently removed from major websites. A woman wears a face mask on a hazy January day in downtown Shanghai. China has ordered a popular anti-pollution film removed from major online outlets. 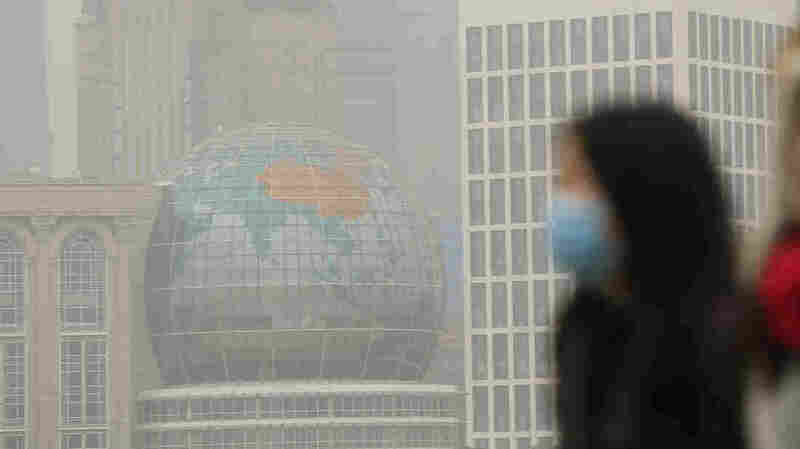 In Xi'an, two people who had protested against smog were reportedly detained. A human rights group says that police in China detained two people Monday for protesting the government's approach to air pollution. One of the protesters was detained for slander, according to China Human Rights Defenders. The group says the pair were released after being held overnight, with an update published Monday citing "the pressure of public opinion at home and abroad." "Photographs released by the group China Human Rights Defenders show seven people holding up signs outside a shopping mall in the western Chinese city of Xi'an," NPR's Frank Langfitt reports. "They read: 'Smog causes cancer. Everyone suffers,' and 'Cleaning up smog is the government's responsibility.'" Reports of the detention follow news that Under the Dome, a two-hour documentary that explores China's smog problem, was removed from major online outlets. It had become a sensation in China, being viewed more than 200 million times since its release at the end of February. Frank adds that the film's removal and the reported detentions "come during the annual session of China's parliament — a politically sensitive time." Reporting on Under the Dome last week, NPR's Anthony Kuhn noted, "Some scenes in the film are shocking, including a visit to a hospital operating room, where viewers see the damage China's polluted air can do to a person's lungs."